Captain Peter’s love of sailing is not surprising. Yachting is central to the posh resort town of Lake Geneva, Wisconsin, where he spent his youth. He describes himself as the wayward son”, wedged in the middle of five siblings. Summers were spent sailing past storied beaches, bucolic parks and Gilded Age mansions, or racking up awards racing catamarans. After college and a short career in psychology, he bought a little monohull and set out for new horizons. Eventually, he was crewing on ocean going vessels and absorbing the fundamentals of passage making in the Mediterranean and Atlantic oceans. Rebecca Garcia’s friends call her Becky, and describe her as good fun, lively and a tireless worker. She’s also an extraordinary cook with an extensive repertoire of recipes. She has run many kitchens, large and small, worked in five-star restaurants and cooked aboard yachts for some 25 years. It all began in the kitchens of her two Grandmothers, one English and one Spanish, when she was so small she couldn’t reach the table without a stool. Becky spent her childhood in London, her teens and early 20s in Donegal, on Ireland’s rugged, northwest coast, and summers with Dad and his family in Spain. She did a lot of amazing things. Her very hardy life” on a small Irish island in the North Atlantic required commuting by row boat in very cold, rough water. She worked with the Irish Civil Defense ambulance emergency team. She helped a master boat builder construct a Viking ship. She achieved diplomas in holistic massage, anatomy and physiology, reflexology and courses in Reiki. Becky says, I love fresh, healthy food, especially colorful vegetarian dishes with delicious sauces, and Mediterranean cuisine. Guests rave about my homemade bread, tasty pastas, fresh fruit salads, cakes and puddings.” In addition to cooking great meals aboard SWISH, Becky might find time to chat about her family’s 1911 50-foot Norwegian gaff-rigged ketch, or her three Atlantic crossings, or the big posh yacht in Guatemala with an owner who accidentally threw himself overboard. With Becky as your chef and hostess, your charter adventure in the Bahamas could include delightful ingredients you never even imagined. Guests enjoy sharing time with little Bella (a Schipperke dog), especially with the dolphin swimming or walks or games on the beach, but equally for clients that are not doggy lovers. In the 1690s, the Schipperke became popular watchdogs on the barges in Belgium and earned its name schipperke, meaning "little captain" in Flemish. 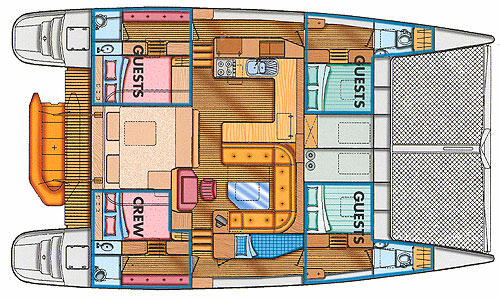 Peter will arrange to board Bella for the duration of the charter if required. Contact us for rates and current availability or to book a charter aboard Swish! Our Bahamas sailing charters include breakfast, lunch, dinner, snacks, and ship's bar. We will accommodate special diets (diabetics, vegans) with prior notice.